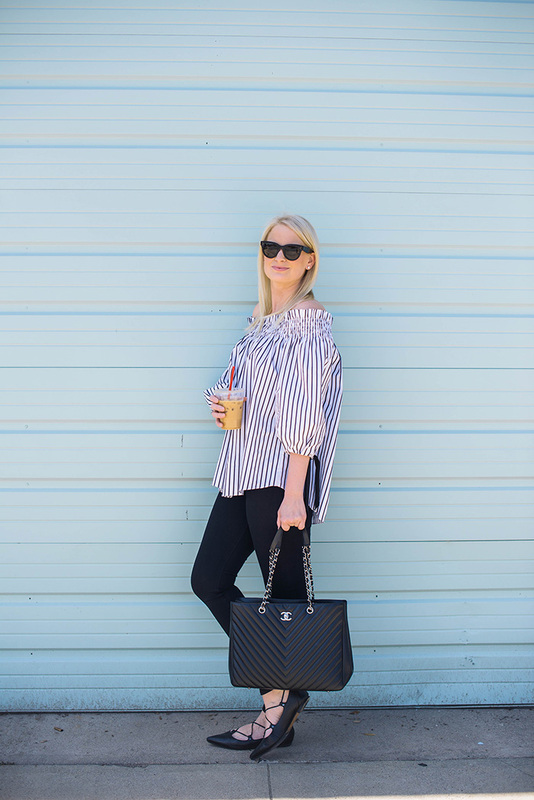 The title of this post could refer to many things: my lace-up flats, the ties on my sleeves, or the fact that I have been SO crazy busy since returning from Hawaii! May has been a month of a lot of big projects for the blog, so I’ve been creating almost double the content. I’ve also been posting something nearly every Saturday and Sunday in addition to my regular weekly content, so it’s been a little nuts around here! On days where I’m sitting at the computer all day editing photos, writing or responding to emails, I’m often tempted to throw on my Lululemon leggings and a sweatshirt. Sometimes I do! 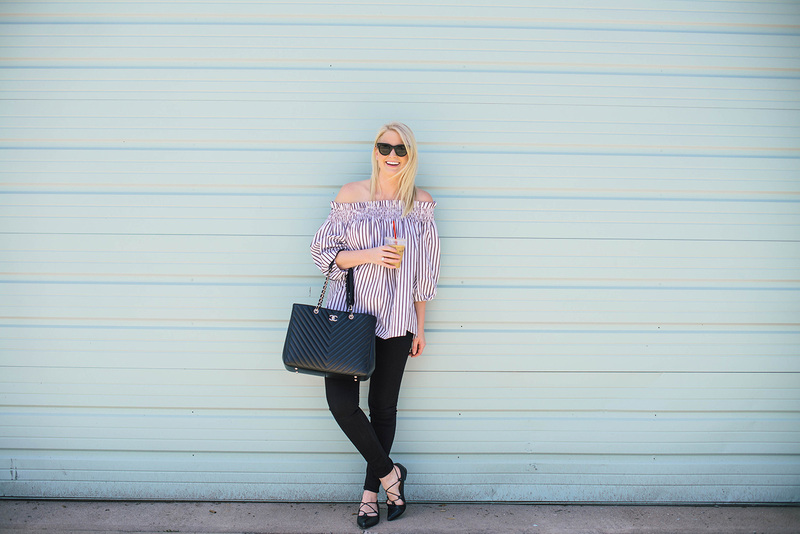 But most days I opt for a simple, chic outfit that I can be comfortable in all day – like this one for example. I’m totally that person that can do an overnight flight in jeans – I just think they are so comfortable! Especially this pair. I’m cold-natured, so I generally don’t opt for a dress unless I know I’m going to be outside. 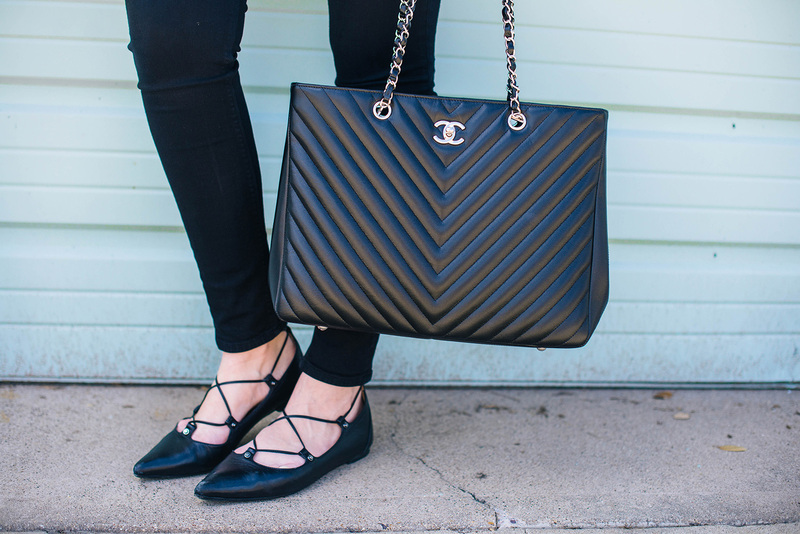 I mentioned these lace-up flats awhile back, but thought it was worth noting again how freaking amazing they feel on your feet! A great travel shoe, to be sure. So comfy, and they happen to come in SEVEN colors now! The best part? They’re under $90. This bag is a beauty, great buy! 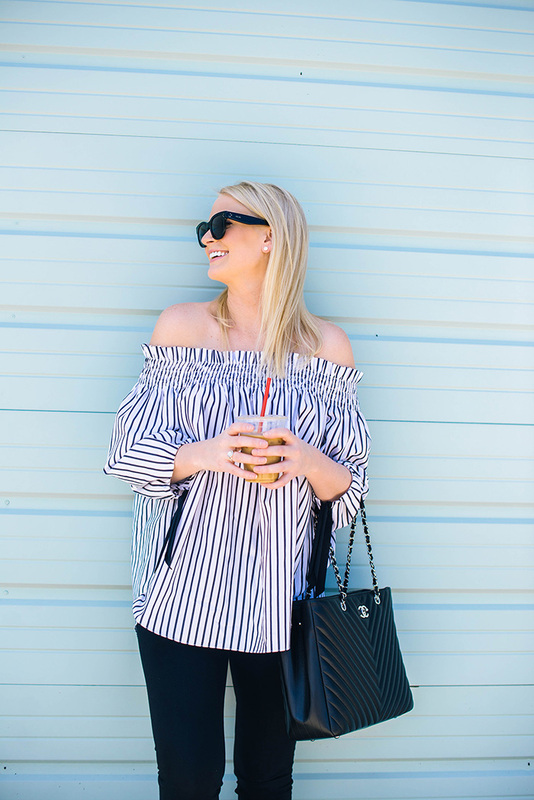 This striped off the shoulder top is PERFECT! I love it. Cool shoes and blouse! I love monochrome outfits. 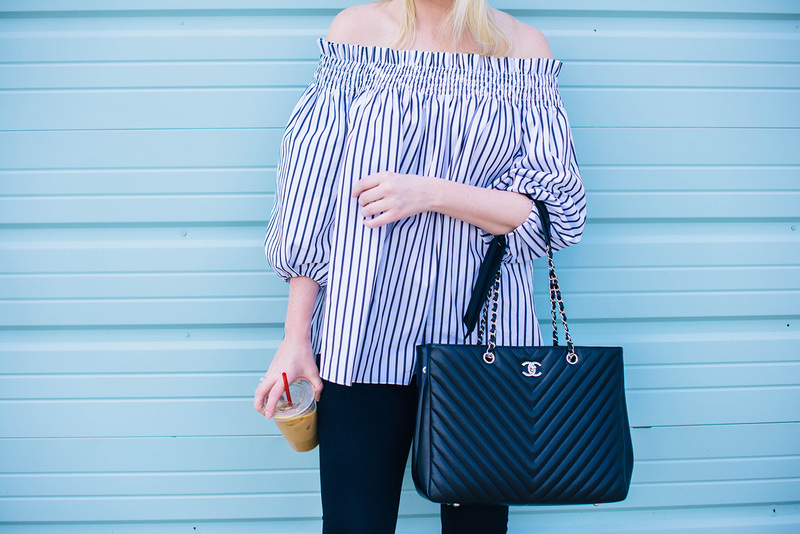 Love the crisp off-the-shoulder! So cute!! 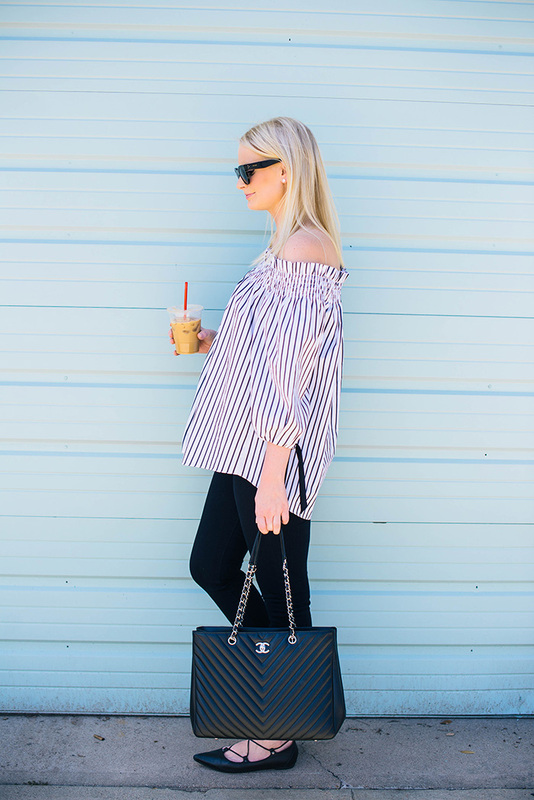 This bag is everything and love this top. head to toe lovely as always. Love that top! This top is so cute!! I have one from Sheinside from last year that I hated but now I am kinda loving big stretchy top! cute outfit ! and i LOVE your bag! so cute! 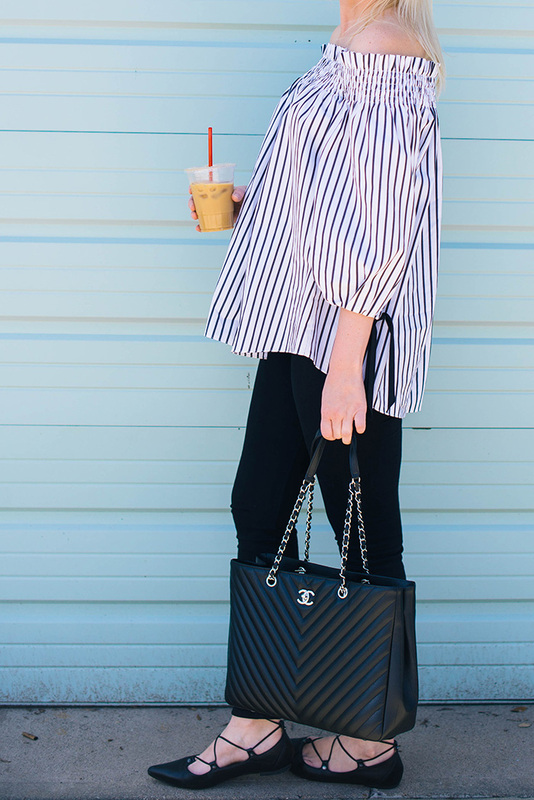 Black and white is seriously so chic! LOVE the look!